I used to feel a little guilty regarding my feelings about Cooley Distillery's malt whiskey. For almost twenty-five years, Cooley was the lone representative of independently distilled Irish Whiskey. In addition to their own brands (Connemara, Tyrconnell, and Kilbeggan) they supplied stock to at least a dozen different (even smaller) indie bottlers in Ireland. On top of that, they even released some single casks to the Scottish independent bottlers, like AD Rattray, Cadenhead, and Adelphi. It was Cooley alone against the mechanized whiskey factory that is Midleton. But I REALLY (*eyebrows lifting dramatically on "REALLY"*) do not like Cooley's malt whiskey. There's a specific thing going on with it that really turns off my palate. In my tasting notes I usually refer to it as "the Cooley thing" or "the Cooley character". It has taken me a year and a half to figure out how to describe it. It's sort of like vanilla-coated stale sugary breakfast cereal dunked in white vinegar. That's the closest I can get to capturing it. And it is specific to their malt; it's not in their Greenore single grain. My guilt was lifted last year when Beam Inc. bought Cooley from the Teeling family. Now it is just another conglomerate-owned Irish distillery. As soon as the ink dried on the sale, Beam decided to let all of their contracts with third party bottlers expire. That means no more whiskey gets supplied to the much smaller companies. As a supporter of small businesses, I should be joining with the rest of the mourners and declare that this is a damned shame. But I REALLY do not like Cooley's malt, so it's difficult for me to get worked up about this in actuality. I have tried twelve different Cooley-distilled whiskies in all sorts of formats: at pubs, official tastings, purchased samples, traded samples, and via my own bottles. I'd like to think I've given their whiskies plenty of opportunities and have even been a little generous in my ratings. But, unless I find something of theirs that's especially delicious and devoid of "the Cooley thing", I'm done. Before tasting this week's lineup, I'd had positive thoughts about the Knappouge Castle 12 year old (with some bottle bottom oxidation), a Greenore Single Grain single cask, and the Tyrconnell 10 year old Madeira Finish. The last of those originally received a booming four stars when I tried it 21 months ago. With a wealth(?) of Cooleys consumed since then, I was ready to give it another try. On the surface, it comes with two big negatives: 1.) Cooley malt; 2.) a sweet wine finish. But maybe it's just crazy enough to work. I received a generous sample of this whisky from Florin who was impressed with it at first but then less so later. Another round of thank yous to him for the whiskey! I had been considering buying a whole bottle for myself. Did he save me from whiskey tragedy? The color is a very orange-tinted gold. It's possible this is its natural color, gaining hues from the wine cask. The nose begins with strawberry preserves, warm nectarines, orange marmalade, and peach schnapps. Warmed dessert wine and sugar cane show up next. In the far background rumbles the Cooley malt. The perfumed palate holds flower kiss candy, blackberry and boysenberry jam, and lychee. Vanilla and milk chocolate notes develop with some time. It's a combo of sweet and tart along with a buzz of heat. The blackberry and boysenberry jams stick around for the extensive finish. Orange Tang and Pixie Stix cover the tongue. The milk chocolate registers with more subtlety. An odd fruit tone shows up sometimes; maybe bitter or underripe fruit? Stinky cheese jumps into the nose first. Then some milder cheeses, along with the aforementioned fruit preserves. After that eases off, it's much similar to the neat nose, but mellower. Maybe some orange rind and tart lemons. The jams kick back in on the palate, followed by vague citrus and vanilla pudding notes. It's very creamy with that Cooley thing keeping its distance. Intense sugary sweetness on the finish. This still holds its charms as a dessert drink. But is it whiskey? Technically, yes, but the malt only makes brief cameos. Due to my feelings about the malt's quality, I wasn't terribly disappointed it remained evasive. On the other hand, it is intensely sweet like a flavored whiskey rather than a finished one. Thus in a blind tasting, one might guess it's a liqueur. While it doesn't feel, smell, or taste like whiskey (to me), I do still like it, especially the jam and fruit notes. I just don't love it the way I used to, nor at the level John Hansell does. So, yes, Florin saved me some whisk(e)y coin. I would recommend this whiskey to someone who isn't big on single malts but does have a sweet tooth, as the sugar is very aggressive. Some of us just can't take the sweeties as much as we used to. To me there's this "ash-y" aftertaste in most Cooley malt that I find off-putting. That's interesting, I think I found that character in the Cooley malt Trader Joe's released. At first I thought it was peat, but there wasn't supposed to be any peat in that one. But I wasn't a fan of that note, whatever it was. Cooley is my favorite Irish distillery. 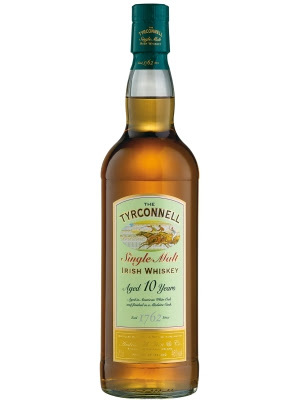 From some this is an endorsement - from me it's an oxymoron; but I actually like their whiskies - like Trader Joe's 4yo of two years ago, standard Tyrconnell and Connemara, even the old Michael Collins 10yo. This one I also enjoyed when I opened it (delicate Caribbean aromas that went well with the yellow fruits one gets in Irish whisky) but I liked it less an less over time. Also, since it's pretty thin I suspect that it doesn't deal well with oxygen - by the time you got the bottle it had been open for a year, only some of that time sprayed with Private Preserve. I was keen to get it because it got a score in the 90's in Michael Jackson's Complete Guide to Single Malt Scotch. Until I read the first pages more carefully to learn that the Irish section was written by Dominic Roskrow. Thanks a bunch DR. In general I didn't have a good experience with finished Irish whiskies, Bushmills 21yo also comes to mind. A sample of Bushmills 16yo was so strange (that one is port finished if I remember well), I suspected it had gone bad - but then again, maybe not. Irregardless (as they say), I'll go ahead, open another bottle of Irish on St Patrick's, and be done with that obligation for the rest of the year. Hey Florin, I updated the sentence in which you were mentioned to better match your observation. I actually had another small pour of the stuff last night for dessert. Thanks! Can't wait to hear what you'll be opening on St Pat's day! Bushmills 16 (or at least some versions of it) has a mix of port, sherry, and bourbon casks. I've got a sample of it here and I'm not sure what to expect. Maybe in March I'll give it a go. It's interesting you mention Caribbean aromas in the Tyrconnel Madeira. With the sugar cane, fudge, and sweet fruits, I wonder if this might be a good malt for rum fans...? Nose: sweet, aromatic, tiramisu, stewed tropical fruits; relatively thin body; Palate: sweet, simple but with tropical flavors. The finish is very well integrated into the whisky. However, the result is somewhat smoke & mirrors - an elusive, feminine rather than a straightforward masculine whisky - it always feels like it's trying to hide something. Clearly very well done, but not on my taste. If you're going to grab an Irish whiskey, Bushmills Black Bush is a really solid pick. It's about what you'd expect from a blended whiskey - uncomplicated and inoffensive, but very, very drinkable. It's not going to blow you away, but it's a nice one when you want something tasty that doesn't require a lot of attention. I really liked my first and only Black Bush (trying hard not to smirk here) but that was a few years ago and I've been cooled off on it by various reports suggesting it went down. Have you had one recently Jordan? That would be comforting to know. Florin, I probably bought my bottle in late 2011. So it's been a little while, but hopefully it's still good. I haven't had Black Bush since 2007, but I do remember it being significantly better than Bushmills' White Bush -- though that's a low-hanging bush. Too far?